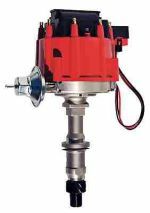 BOP Engineering introduces the ultimate Distributor/Oil Pump Drive Gear for the Traditional Pontiac V-8. Crafted from Carbon Ultra-Poly, this gear replaces worn bronze distributor gears and may be the last one you ever buy! These gears have undergone stringent testing with excellent results. Never worry about metal shavings in your oil again. Shaft sizes include .491-inch for stock applications and .500-inch for aftermarket MSD. Pontiac Distributor Hold Down - fits all Pontiac V-8 Includes bolt. These Pontiac Stainless Steel Roller Rockers incorporate an exceptional lightweight design that provides plenty of clearance for large diameter springs. These are manufactured from premium quality 15-5ph stainless steel, a superior alloy that is high in Nickel and Chromium. This rigid premium material provides high yield strength to help resist deflection and has extraordinary fatigue resistance. The nose rollers and shafts are Cr40 steel, heat-treated and hardened to resist the severity of racing and to minimize "scrubbing and wear. Rocker kit includes fits '55 -'81 287-455 & 4.3L Pontiac V8 and include ROCKER LOCS T lock nuts. These Pontiac Aluminum Roller Rockers are made from high strength 6061-T6 aluminum extrusions, each piece is precision CNC machined to allow for larger springs and retainers with full-cage friction reducing needle bearings for added durability. The nose rollers and shafts are Cr40 steel, heat-treated and hardened to minimize the wear that naturally occurs between the roller tip and the valve stem. They also have an Internal oiling system for long lasting performance. Rocker kit includes fits '55 -'81 287-455 & 4.3L Pontiac V8 and include ROCKER LOCS T lock nuts. These Straight Rocker Studs 7/16-20 x 7/16-14 x 1.900 are a must for any adjustable valve train when using non-stock camshafts. Works well with the Aluminum and Stainless rockers ALR52-65 and SSR52-65 and Poly Lock Nuts PRN42. Set of 16. 7/16 Poly Lock Rocker Nuts are high quality nuts featuring poly lock locking system. For Use with PRS39 Rocker Arm Studs. Set of 16.